Fine art paper, journals and notebooks, colored pencils, oil pastels, watercolors, and pens of all kinds and functions, the National Book Store Make and Create Arts and Crafts Festival had everything that budding artists and art fans could possibly need. For the two-day event, the Prestige Paper Brands sold journals, notebooks, and sketchbooks at a discount. All the products displayed at the festival are also available at the National Book Store branch in SM City Cebu. ARTS AND CRAFTS FESTIVAL. The 2-day event by National Bookstore featured fine art paper, journals and notebooks, colored pencils, oil pastels, watercolors, and pens of all kinds. Buyers were able to choose to have their plain-covered journals personalized with their names or favorite quotes. This was done for free by the brand’s calligraphy expert. Limelight notebooks are made of paper that´s up to 120 gsm so it’s thick and perfect for sketches or art works using watercolor. The company also carries the Fabriano and Acquarello fine art paper products that have cotton in their composition. Fabriano has 20 percent cotton while Acquarello is made of 100 percent cotton. This makes both paper lines capable of holding water. Sam Josef Abatayo, Sharpie brand management trainee, said they have specialty pens that can be used on various materials including fabric. Sharpie markers can be used for artworks on shirts, bags, and sneakers, he added. To make the design more permanent, it will have to go through a heat setting process. Marvy Uchida is a Japanese brand that retails calligraphy, drawing, coloring, brush, and specialty pens. 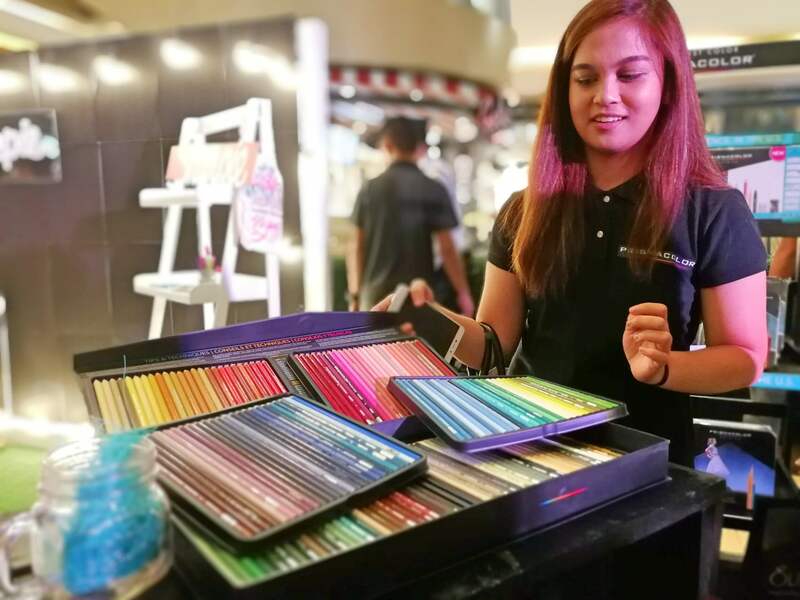 It sells ball point and chisel and bullet types as well as gel pens and highlighters for school and office use, according to May Janine Fernaneo, Marvy Uchida marketing officer. The brand also carries drawing and calligraphy pens as well as fabric and other markers for hobbies and crafts. Prismacolor has a colored pencils set with a staggering 150 hues for professional use. There are National Book Store products like Chameleon’s one pen blends and multiple tones and Caran D’Ache’s oil pastels and colored pencils. Faber-Castell also has a lot of materials for children and students, from the soft touch brush sets and tri-grip brushes and watercolors to colored pencils and crayons. Elmer’s Glue offers more choices now as well and has a colored line for more interesting artworks. When it comes to pens and markers, Uni carries a diverse range of products. There are the Jetstream, Uniball, Click Gel, and Signo lines. It also has drawing pens, mechanical pencils, correction pens, highlighters, as well as several kinds of markers for a host of functions and uses.